It takes $3,500 to hire ONE new employee at PORTCO and equip them for success. On May 14, YOU are the philanthropist and can say “You’re Hired!” to one new employee with your gift. 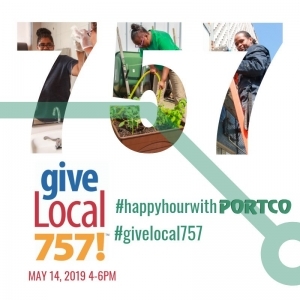 This year, do Happy Hour with PORTCO on GiveLocal day! Our goal is to earn the most unique donations between 4pm and 6pm on May 14 for the chance to win an additional $757 towards that “You’re Hired!” moment. Check out PORTCO’s Facebook event page, Happy Hour with PORTCO, click “Going” to RSVP and invite friends and family. We truly cannot do this without you! Thank you! Each May the Peninsula Community Foundation hosts GiveLocal757, a giving day in the same vein as the national Giving Tuesday. Give Local 757 is a 24-hour fundraising event at its core. The GiveLocal757 2019 is Tuesday, May 14th. Adding to the fun and excitement of the day are various prizes that non-profits can win to earn additional funds.